Let’s get down to business; microphones are what we’re here about, right? 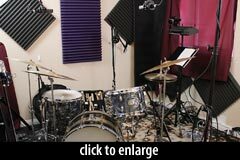 In this review, I’ve compared some microphones that I commonly use on drums and that are commonly found in many home studios against a set of Lewitt Audio Microphones. All were recorded into ProTools via an M-Audio Profire 2626. No processing was added to any of these tracks. In comparison to both the C1 & KSM32, this mic seemed to have more meat in the low end and also more presence in the mid range. The high frequencies were nice but a little harsh to my ears at times, although I’m sure with a little EQ they would smooth out. Overall I would say this mic had great punch and detail, and really worked great picking up the entire kit. This mic also is packed with filter and pad options that favor a drum kit along with many other sources [see the LCT640 profile for full specs –Ed.]. I reviewed this mic against an SM57 which we all know is the standard go-to snare mic. Against the ’57, this mic didn’t have quite as much high-end bite, and it seemed to have more midrange to it. The snare was tuned the same and played the same for both performances, but still I seem to hear a little more low/mid range resonance from the drum through the Lewitt microphone. 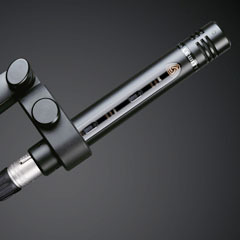 The MTP440 would be a great mic for aggressive, high-tuned snares due to it’s mellow high end. This was a nice mic and certainly gave a specific sound. In comparison to my favorite kick-drum mic, the Shure Beta 52, the Dynamic channel on this mic was somewhat lacking in the low end, and it seemed to have more high end than the Beta 52 (lending itself to more snare bleed). However, it still had great punch and sounded solid. Up next is the LCT340 small diaphragm condenser. I only used the omni capsule in this review. In comparison to the Rode NT5/Omni, the body was there but the high end wasn’t nearly as bright. It got a great punch and body from the kit and really did sound nice when used as a room mic but it didn’t have the shimmer that the NT5 had. I also tried this mic as a piano room mic and ran into the same deal: slightly muffled high frequencies. This could be a great thing for other applications; for instance when I messed around using the cardioid capsule, the mic sounded very pleasing on hihat & acoustic guitar because it wasn’t overly harsh. It comes with both Cardioid & Omnidirectional capsules along with a four-position pad & low cut filter [see the LCT340 profile for full specs –Ed.]. Last up is the Lewitt DTP340 tom microphone. This mic had a very nice and round tone, not overly bright or muddy. Also it was very easy to position due to its small size. On stage, this would would work great on any toms or auxilary drums. 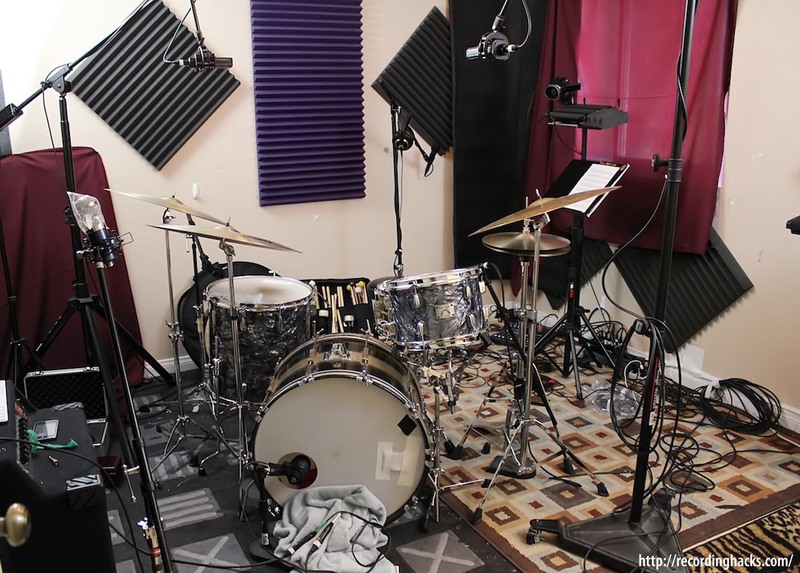 In the studio, I would keep this on the rack tom and put something with more low end on the floor tom — such as a Sennheiser MD421, an AKG D112, or a large-diaphragm condenser. I prepared a mix of Dave’s tracks, to give an overview of how these microphones work together. No processing was done except for the addition of a compressor plug-in (Bomb Factory BF76, “pump” preset) on the room mic. Individual tracks were gain-matched, so that (for example) the kick track level is consistent for both mixes, as is the snare track, the OH tracks, etc. The DTP 640 REX is a dual-capsule mic, but the condenser capsule on our sample mic was broken. We’ve used just the dynamic channel in the mix below. Needless to say, this is not a fair test of this mic’s performance, because the condenser capsule would have captured more of the tone of the kick drum. We will try to revisit this mic with a fuller evaluation in the future. In the meantime, you can see a comparison of the Dynamic element’s frequency response vs. the Beta 52A in the graph at right (click to zoom). In each of the three pairs of clips below, Dave’s mics are first, followed by the Lewitt mics. All are 320 kbps stereo MP3s, converted via lame from the 24-bit, 48kHz originals. 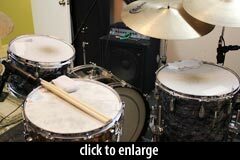 These mics really did well on the drum kit and overall I was able to get a nice sound out of them. I would especially suggest these mics for live sound applications for a few reasons. First would be these mics had great punch to them: very dynamic and detailed. Second, these mics didn’t have a muddy low end at all. Everything was well-defined. Lastly, these mics seemed quite durable and well-built, lending themselves to a long life on the road. That said, these are equally suited for studio use, especially the LCT640 & LCT340 which are both packed with features. All in all these mics are well-built, have great mounts, and most importantly can deliver a great sound. Dave Rollans is a session musician and music educator based in San Diego, CA. 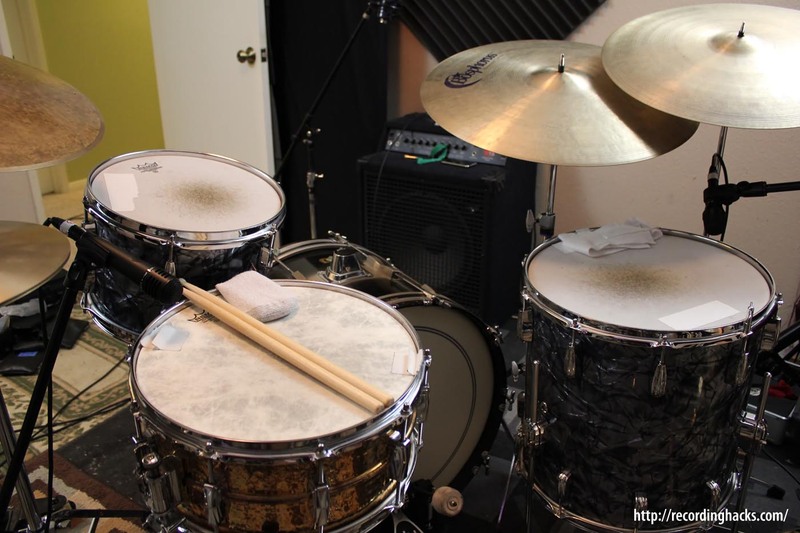 In addition to playing live and studio dates across the West Coast, Dave offers online video-based private drum lessons and music instruction through his Interactive Music Teacher website.